We’re passionate about growing healthy apples, pears, cherries, and blueberries, but that’s not where the story ends. For years, Rainier Fruit has put our support behind programs that encourage healthy eating and active lifestyles for children. We started in our own community here in Washington, and now we’re expanding nationwide. Just last week, our support helped kick off a new Garden Grant program for 39 schools across Tennessee. The Garden Grant Program will provide a total of $81,000 to 39 schools and youth organizations across the state through a partnership between the Whole Kids Foundation and the United Health Foundation. The grants will help the selected schools and organizations build or expand existing fruit and vegetable gardens, salad bars or beehives. The Garden Grant also facilitates education about agriculture, caring for the environment, and maintaining a healthy lifestyle. Tennessee currently ranks 50th in the United States when it comes to youth obesity. That means more than one third of children between age 10 and age 17 are overweight or obese. The national average is a startling 31 percent, demonstrating a need for programming of this nature across the country. Moreover, studies show that gardening programs, when combined with nutrition curriculum or healthy school lunches, encourage healthier food choices. The habits we learn during childhood often form our natural behavior patterns as adults. Ergo, putting these programs into practice with young students will help guide them toward healthy choices as they grow. 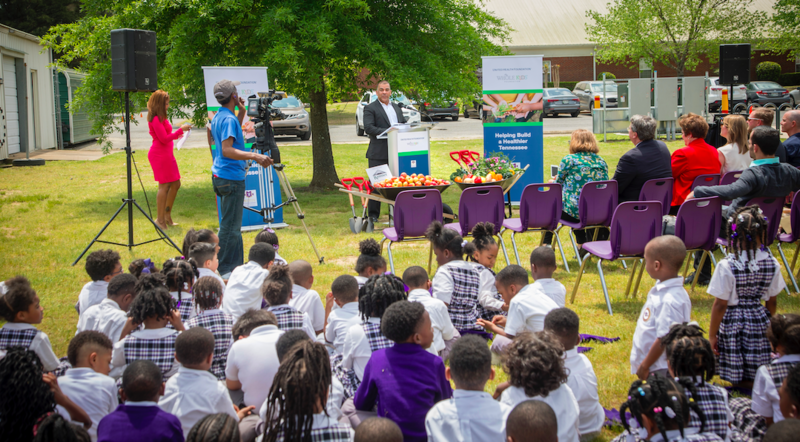 Last week’s kickoff event was held at Nexus STEM Academy in Memphis, and featured a whole wheelbarrow of apples from Rainier Fruit. It’s no surprise to us that the apples were the kids’ favorite part of the celebration. Apples are a great introduction to healthy mealtime choices. Kids love sweet, sometimes tart, crunchy fruit, making it a welcome side instead of french fries or chips. The sweetness of an apple also makes it a great dessert option. Apples can replace packaged treats that often include lots of added sugar and a high fat content. New studies on emotion-based eating reveal the importance of childhood eating habits. Foods that we associate with comfort and safety as children often become the foods we gravitate toward in times of stress as adults. Changing the landscape food that is available and familiar to kids helps lay a foundation for healthy eating in adulthood. We’ve shared other success stories about school garden programs, and have been impressed by just how attainable projects like these can be. In each example we hear about, one result is the same: kids are much more interested in eating fruits and vegetables that they’ve helped grow. Being involved in the process turns kids from food critics into stakeholders. Vegetables become familiar not scary. With parallel educational resources, kids understand the processes that transform seeds to the fruits and veggies they see on their plate. Want to get involved? There are community organizations across the country that are undertaking this important cause. Start small! See what your local schools are doing, and what kind of help they might need to make the programs a success. Let’s not forget, healthy eating is only part of the equation. Getting involved as a coach, mentor, or supporting your local athletics programs can make a larger impact than you might think. The best way to help kids make healthy choices? Lead by example! Planting a garden at home and involving your children in tending it is a great way to build a solid foundation for healthy living.